Photoshop 7 does have a watercolor filter, but in most cases, I find that it makes the images too dark with too many odd-looking brush strokes. Therefore, we use another approach. ■ Click the Background layer in the Layers palette to make it the active image. ■ Click the Hide Layer icon in the left column in the pen-ink layer to hide the top layer. The Layers palette should now look like the one shown in Figure 33.4. 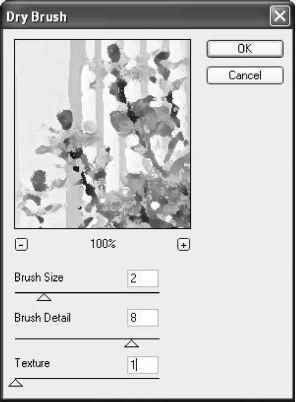 ■ Choose Filter ^ Artistic ^ Dry Brush to get the Dry Brush dialog box. Click in the preview window and drag the image around until you can see a few flowers. Begin experimenting with the settings for Brush Size, Brush Detail, and Texture. I used 2,8, and 1, as shown in Figure 33.5. Click OK to apply the settings. To soften the brush strokes and make them look more like a watercolor wash, use a blur filter. ■ Choose Filter ^ Blur ^ Smart Blur to get the Smart Blur dialog box shown in Figure 33.6. Try using a Radius of 10 and a Threshold of 50. Also, make sure you have Quality set to High, and that Mode is set to Normal, before clicking OK to apply the settings. many variables and settings for each of many different techniques; what works on one image, may work poorly on another. 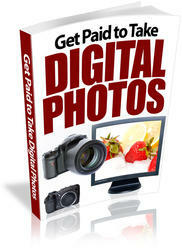 In general, these steps work well on images that are about 1600 x 1200 pixels in size and have been taken with a digital camera. On larger files, and when photographs have been scanned with a flat-bed scanner or negatives or slides have been scanned with a film scanner, the same techniques work well if you first apply a light Gaussian Blur to the image. The larger the files, the better this technique seems to work provided that the image is a good-quality image with minimal grain. Sometimes, you may also find that an image can be made to look more like a watercolor painting if you apply some of these filters more than once. Experimentation is the key to getting what you want.